I've been getting quite a few scrapbook pages done with the My Memories program. Recently I've been working on some layouts from our trip to Florida but when I saw the current challenge at the My Memories blog I wanted to make something to play along. They have a few themes to choose from, I went with the one that shows A PARTY or FIESTA. My daughter Livy's 8th birthday party. Notice the weirdly scratched out faces! That's the only way I could figure out how to disguise the other kids! Probably would be fine to leave it as is but I didn't want the hassle of asking all the parents for permission to post this. Next time I take the kids to Chuck E Cheese I'm getting my own cup of tokens. I noticed I have a tendency towards these 2 sentences. 1. "Ohhhh I'm really good at this game....Want me to play it for you?" Which gets me an eye rolling from my kids. 2. "Uh hey, lend me a token so I can have a try at alley ball." With this my kids don't even acknowledge that I've spoken. Thanks for looking, and if you want a copy of the My Memories software, remember to use the code on the right-hand side to get $10 off and $10 in product! Beautiful pictures and layouts. Love all your embellishing! Thanks for joining the ODBD Shining the Light Layout challenge this week. very nice scrapbooking page, and lovely embellishment. Thanks for sharing it with us at Robyn's Fetish this week. Wonderful layout. I love the colours and all the little details. Have to snicker a bit about the faces though...I totally get why you did it (so much easier that getting permission) but it looks like someone was jealous of the other kids at the party and scribbled on their faces. :-D Still, it doesn't take away from your fabulous layout. Good ol' Chuckie Cheese. ;) My kids LOVED going there when they were younger! I liked alley ball, too. That was my personal fave. 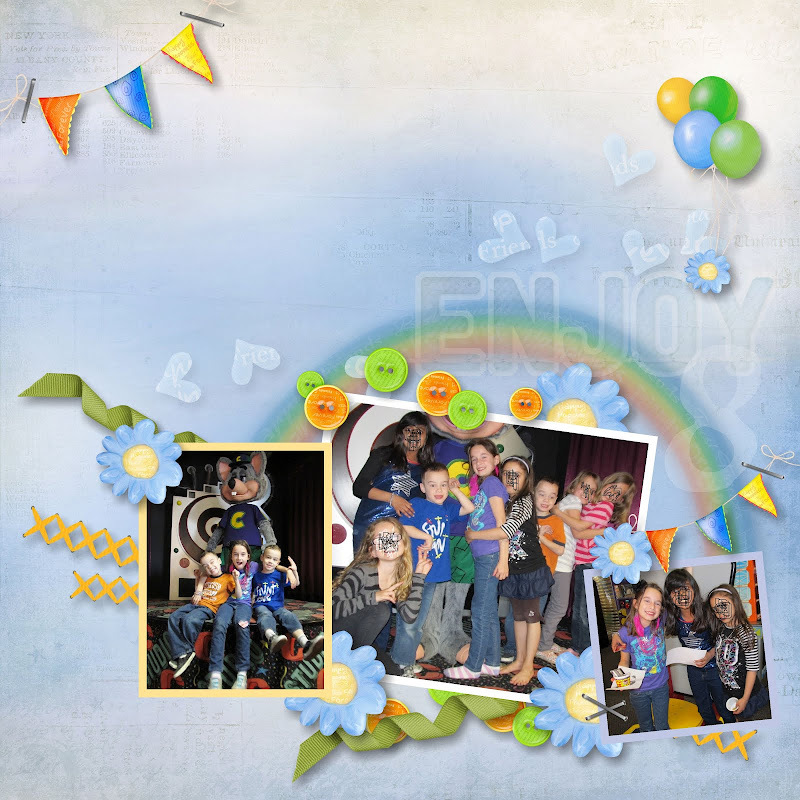 The rainbow theme goes really well with these fun pics, and the bright buttons are such a great touch! Thanks for playing with us at Creative INspirations Paints!